Melzer started out as porcellain painter in Teplitz, Dresden and Rudolstadt. Together with Georg Tappert, he founded in 1910 the art school „Moderne Schule fuer Freie und Angewandte Kunst“ in Berlin. One of his students was Wilhelm Morgner. In the same year he was founding member of the Berlin „Neue Sezession“ after his works had been rejected by Max Lieberman of the „Berliner Sezession“. He later exhibited at the international „Sonderbundausstellung“ and at the „Salon des Indépendants“ in Paris. With Georg Tappert, Max Pechstein, Cesar Klein and Heinrich Richter-Berlin he was founder of the „Novembergruppe“ in 1918. Melzer developed his very characteristic monotype technique from 1909 on. He chose linoplates as ground on which he painted with oilcolours. A paper laid and pressed on the wet oilcolour allowed him to draw a print from the plate. A maximum of three prints of one painting session could be drawn. The monotypes on paper then were individually modified and overpainted. 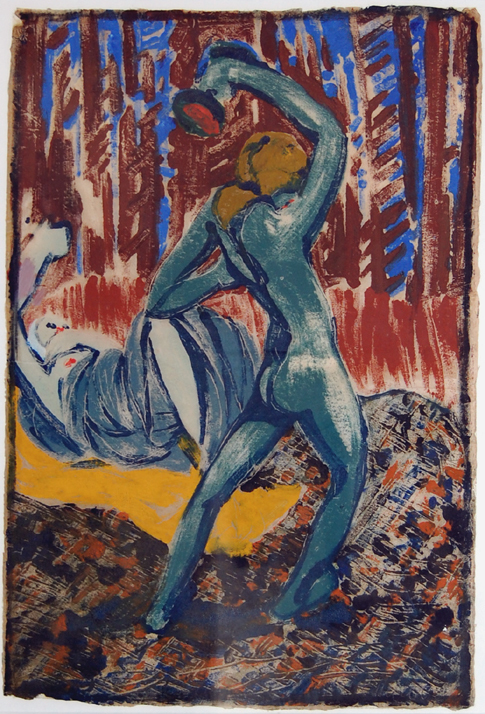 Another variation of the early monotype „The blossom dance“ is known in a German private collection.